PRESIDENT'S CHATI trust you all had a good Christmas and every best wish for 2019. 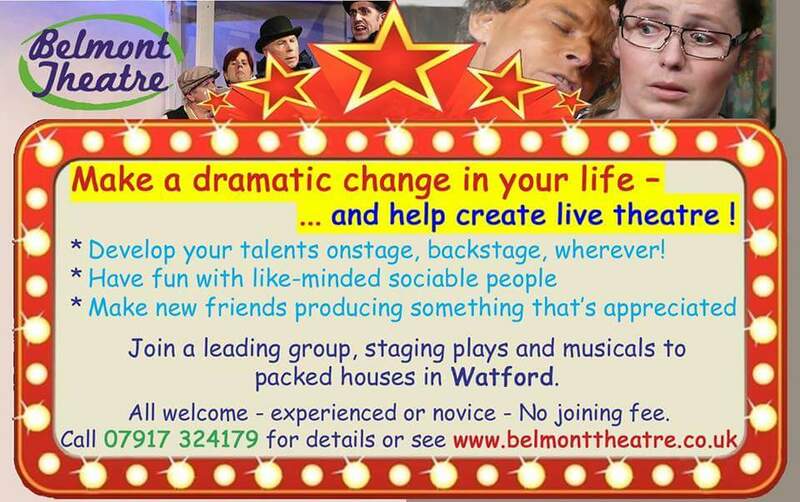 It promises to be a busy year for the group and in true Belmont style we have the next 3 productions planned. Plenty to keep us busy. The ticket sales for Bothered and Bewildered are a bit sluggish, not surprising during the busy Christmas period, so now is the time to really spread the word. The rehearsals are looking good, some delightful characters developing, so all bodes well for another Belmont success. Thanks to Mary Woolf for yet again organising, so efficiently, our festive Christmas meal. It was a lively affair and Judi, on behalf of us all, spoke of the groups appreciation to Mary for all her work for the group over the years and how she and John will be missed as they plan their move to Devon. We enjoyed another social at Mary’s house for our popular mince pie event. Unfortunately Mary missed this as she was in hospital. Thankfully only a brief visit. Best wishes for the New Year and look forward to seeing members at rehearsals to support the cast and the backstage crew. From May 22-25 we will present 'Ken Ludwig's Be My Baby'. This will be directed by Carole, with Lorna as Assistant Director. Readthrough on Tuesday March 5th and auditions on Thursday 7th. 7.45 pm at Carpenders Park Hall. This is a comedy by the writer of the hit comedy 'Lend me a Tenor' and features a mature couple forced to travel to the USA to collect a baby who their younger relatives plan to adopt. They meet many colourful characters on their journey and return transformed, thanks to the cutest baby in California. Character breakdown will shortly be on the Belmont website so keep checking. Copies of scripts available in due course if interested. Don't forget if you are a paid up member or patron you can ask to join the private Facebook group to be kept up to date on all things Belmont. Copyright © 2018 Belmont Theatre Company. All rights reserved.